Arvind Kejriwal needs no introduction. By his dedication and hard work, he has proved that a common man can also become a great leader and can become CM of the capital of India. Talking about his earlier life, he was born on 16 August 1968 in Hissar, Haryana. His father was an engineer and he spent most of his childhood living in small northern Indian towns like Sonepat, Mathura and Hissar. He is happily living a married life with his wife Sunita, who is also an IRS officer, and two children. Presently Sunita is working as an Additional Director in Serious Fraud Investigation Office, Ministry of Corporate Affairs. By his qualification, he has done B.Tech in Mechanical Engineering from IIT Kharagpur in 1989. Arvind Kejriwal joined Tata Steel right after his graduation but quit his job with Tata Steel in 1992. After that, he spent some time working with Mother Teresa’s Missionaries of Charity in Kolkata, the Ramakrishna Mission in the North-East India and Nehru Yuva Kendra. Kejriwal joined the Indian Revenue Service in 1992 after qualifying through the Civil Services Examination. In February 2006, he voluntarily resigned from the IRS as Joint Commissioner in Income Tax Department. After voluntary resignation from a job, he founded Parivartan, a Delhi-based citizens’ movement which works on ensuring a just, transparent and accountable governance. Arvind Kejriwal won the Roman Magsaysay award in 2006 for his contribution to the enactment of the Right to Information (RTI) Act, 2005. In 2006 after resigning from IRS, he founded an NGO Public cause Research Foundation. Public Cause Research Foundation was set up on the 19th of December 2006 by Magsaysay awardee Arvind Kejriwal, former journalist Manish Sisodia and Abhinandan Sekhri to ensure that society becomes more inclusive and that real power rests with the common citizens of India. Arvind Kejriwal has written a book “Swaraj”. If you throw ink at me, I will use it to create history. But Arvind Kejriwal (Aam Aadmi Party/Common Man Party) made a stunning comeback in Delhi Assembly Elections 2015 by winning 67 of Delhi’s 70 seats. 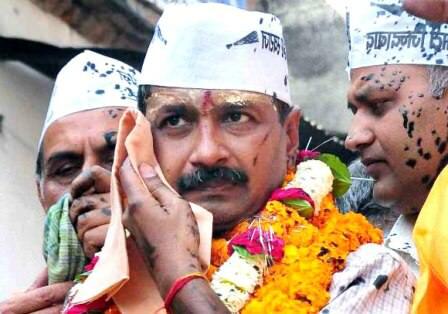 Arvind Kejriwal will take oath as chief minister at the Ramlila grounds on February 14 or 15 or 16. Arvind Kejriwal is only the second Chief Minister to be an IITian after his Goa counterpart Manohar Parrikar. But now people have given him a chance to fulfill his promises. It will be really interesting to see how Arvind Kejriwal responses to his promises that he made before elections. We hope he will meet the common man’s expectations.